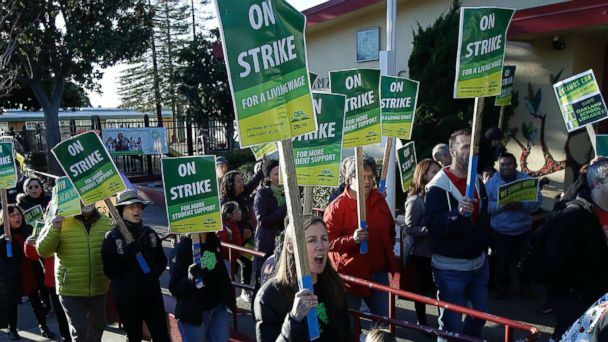 A national wave of teachers' strikes rolled into Oakland, California, Thursday where more than 3,000 public school educators hit picket lines in a fight for higher wages, smaller class sizes and better overall working conditions. The first teacher strike in Oakland in 23 years came after two years of negotiations between the Oakland Education Association and the Oakland Unified School District failed to produce an agreement. Teachers agreed to vacate classrooms after rejecting the latest offer from the school district on Wednesday. Bargaining is expected to resume on Friday and teachers said they are prepared to stay on strike until the district gives them a reasonable deal. "It will take the Oakland Unified School District to listen to the community. So far we have been bargaining for two years ... and have seen very little movement from the district," Keith Brown, president of the teachers' union, told ABC San Francisco station KGO-TV on Thursday. Schools for Oakland's 37,000 students remained opened Thursday with substitute teachers filling in for the striking educators. "Students should attend school during the strike as regular attendance policies apply unless an official announcement is shared from the District," OUSD officials said in a statement posted on Twitter Thursday morning. Many parents, however, kept their children out of classrooms and joined teachers on the picket line. "As a parent, I want to teach my son to be an active participant in our society," Erica Garber, a parent who marched with her 5-year-old son on the picket line, told the San Francisco Chronicle. "The cutbacks at my son's school have been dramatic. There's no school nurse, and they're talking about cutting the librarian." The teachers were also getting support from Sen. Kamala Harris, who grew up in Oakland and launched her bid for the Democratic nomination for president of the United States there last month. "Teachers invest their time and energy to educate the future of our country and they deserve our support," Harris said in a Twitter post on Thursday. "Standing in solidarity with the thousands of Oakland teachers who are striking to demand better pay and classroom conditions." To stem the tide of teachers exiting the Oakland Unified School District, the union is asking for a 12 percent raise over three years, smaller class sizes and more support staff, including nurses, counselors and librarians. The school district is offering a 5 percent raise, retroactive to when the union's contract expired in July 2017. The union is also asking for a promise from the school district not to close any schools. The union and the school district began bargaining on a new contract in December 2016. But after 30 negotiating sessions encompassing 200 hours of bargaining, an impasse was declared on May 18, 2018. Both sides agreed to mediation but that failed to break the stalemate. A state-appointed arbitrator assigned to look into the labor standoff submitted a fact-finding report over the weekend that said the school district can't afford to give the teachers a 12 percent pay hike over three years. The arbitrator, according to the report, recommended giving the teachers a 6 percent raise retroactive to the 2017-2018 school year and continue negotiations on future pay raises. The arbitrator's report also showed an 18.7 percent annual teacher turnover rate in the school district. "This is well above the state average," the report said. "Also, the retention is even worse at some high-needs schools, with West Oakland Middle School retaining only 9.1 percent of its teachers over a nine-year period." Shannon Brandon, a science teacher in Oakland, said she and other educators are prepared to strike for as long as it takes to get a fair deal. "We are here to send a message that things aren't OK," Brandon told KGO-TV. "And they haven't been OK for a very long time." The Oakland teachers' job action was launched as West Virginia teachers returned to class Thursday after striking for two days over an omnibus education bill they say was retaliatory for their nine-day strike a year ago this week. The West Virginia teachers called off their strike after the state House of Delegates voted to indefinitely table the bill, which would have established the first charter schools in the state and provided parents vouchers for private schools. Last year's West Virginia strike ignited the wave of teachers strikes in Oklahoma, Kentucky, Arizona and most recently Los Angeles and Denver.